Deadlock occurs when 10 instance is created at the same time? commitwhenaborted] Could not commit transaction. 1. Re: Deadlock occurs when 10 instance is created at the same time? Any possible that you can attach the examples that we can try out? 2. Re: Deadlock occurs when 10 instance is created at the same time? Thanks for the quick response Unfortuantely, due to the non-disclosure that I signed with my company, I can't give you the exact codes of my bpel.. what i can do though, is to create a sample bpel and how i am accessing it. 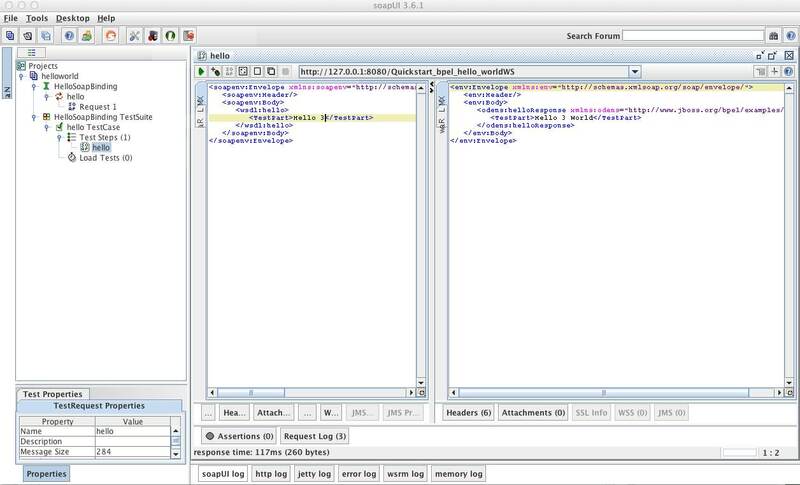 in the meantime, attached here is screenshot of the deadlock graph from sql server profiler... I'll post the bpel, c# codes as soon as i can. 3. Re: Deadlock occurs when 10 instance is created at the same time? 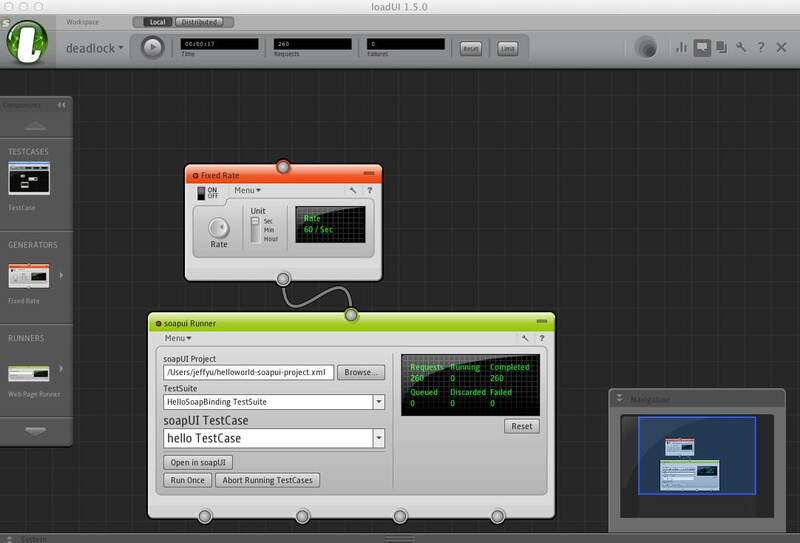 I tried to deploy the hello_world example in the quickstart folder and created a test case suite using SoapUI and loadtest the test case suite using LoadU and encountered the same deadlock problem. settings for the LoadUI is 10 concurrent request 0 time interval..
4. Re: Deadlock occurs when 10 instance is created at the same time? According to your description, I've tried the LoadUI (1.5.0), SoapUI (3.6.1) with RiftSaw 2.3.0.Final (on Mysql database), it is running fine, I am not sure if I am configuring something different from you, or I am missing something here. 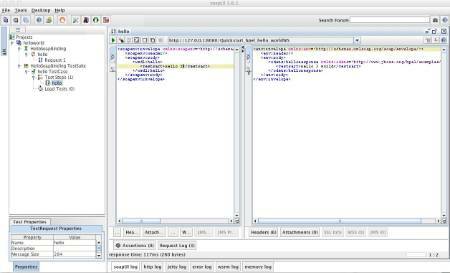 Here is the soapUI's test suite. 5. Re: Deadlock occurs when 10 instance is created at the same time? well, I've just used the same loadUI settings against sqlserver database, and yeah, I've seen the same deadlock error, like following.. I'am going to investigate further, however, if you've got a chance, could you please try to use the sqlserver's jdbc, instead of jtds one? 16:06:57,247 ERROR [JDBCExceptionReporter] Transaction (Process ID 55) was deadlocked on lock resources with another process and has been chosen as the deadlock victim. Rerun the transaction. Caused by: java.sql.BatchUpdateException: Transaction (Process ID 55) was deadlocked on lock resources with another process and has been chosen as the deadlock victim. Rerun the transaction. 6. Re: Deadlock occurs when 10 instance is created at the same time? tried it using sqljdbc4.jar... I'm seem to be encountering the same deadlock problem(see below). n as the deadlock victim. Rerun the transaction. 7. Re: Deadlock occurs when 10 instance is created at the same time? May I know that if you are running the riftsaw against local database? or a remote database? An interesting thing is that I've tested the RiftSaw 2.3.0.Final against local Mysql and Postgresql database, both are running fine at 100/sec rate. However, if I ran the riftsaw against a remote mysql database, it will throw out "org.jboss.util.NestedSQLException: Unable to get managed connection for BPELDB;" exception. With the remote database, it will take about 1 min to run a simple quick_start in my case. (most likely the network is not good here). I've seen your exception with the remote sqlserver database. Sorry that I didn't test it with local sqlserver database, as I don't have it.. It would be appreciated that you can test the riftsaw against your local sqlserver database if you were using a remote one. 8. Re: Deadlock occurs when 10 instance is created at the same time? No worries. I'm running both Riftsaw 2.3.0.Final and sqlserver in my local Also tried using mysql database and is working well. I've been looking into some threads regarding the sqlserver deadlocks though..
suggested to add indexes.. tried this but seem to encounter the same deadlock problem. 9. Re: Deadlock occurs when 10 instance is created at the same time? Thats good to hear, it means this issue is sqlserver specific. RiftSaw added the JPA based Hibernate implementation on top of current JPA impl. It doesn't use the native Hibernate one in ODE, so this fix shouldn't be applied in this case. 10. Re: Deadlock occurs when 10 instance is created at the same time? A workaround for this issue to set the transaction isolation level to 'snapshot' for each connection. We are addressing this in the Riftsaw 2.3.6 branch.